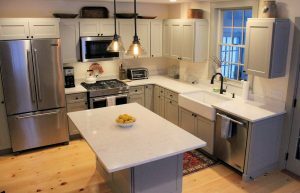 How lucky were we to be asked to help with one part of this amazing restoration/remodel project on Martha’s Vineyard? This home has been in this couple’s family for a long time—it’s over a century old, with many original components. The kitchen remodel had to work with the style of the original elements which were being preserved—exposed beams, etc. We are thrilled that the family is delighted with the final results!